Vote in the Christian Small Publisher Book of the Year award. Intermission for Reverend G is a compelling story that lifts the heart and hopes of the reader, no matter their circumstances. Intermission for Reverend G had me turning the next page, wondering how this praying and caring lady could possibly stay upbeat in her confusing Alzheimer world. Humor, faith, and realism mingled compatibly with Reverend G’s down-home flavor of common sense. 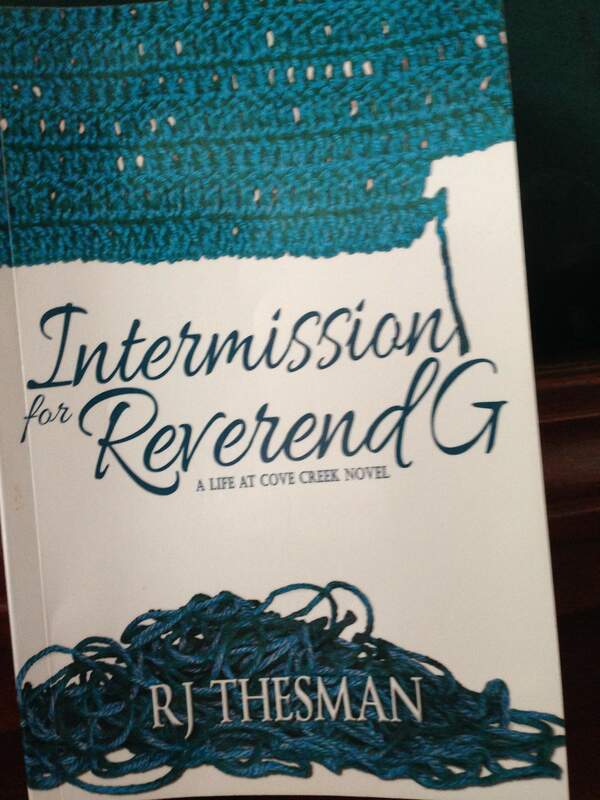 Her God-given gift ministering to others about the saving grace of Jesus Christ makes Intermission for Reverend G a must read for everyone. 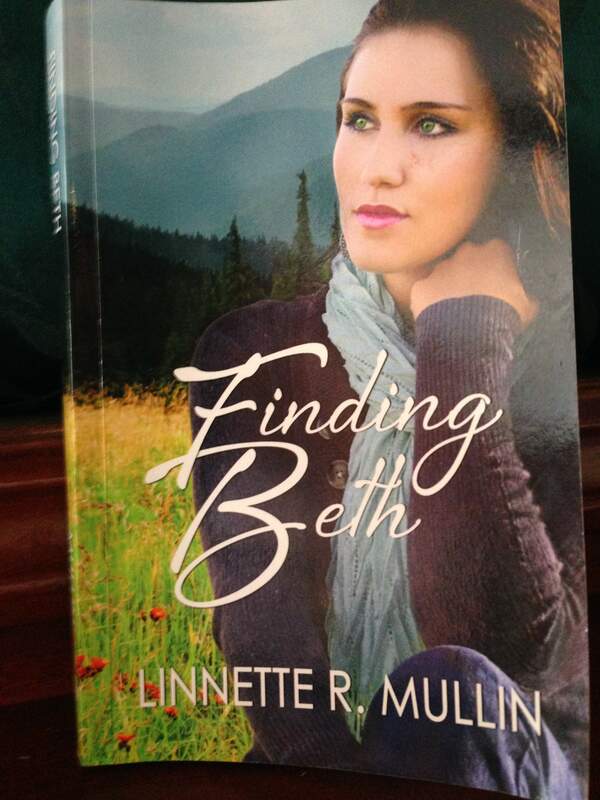 Linnette R. Mullin in Finding Beth tells it like it is. It is never too late to get out of a bad relationship and Finding Beth brings this truth out beautifully. Packed full of love, adventure, and suspense, Finding Beth had me turning the pages wondering what would happen next. Guilt, anxiety, and indecision plague us all at sometime in our lives. It wouldn’t hurt to read Finding Beth before committing to a lasting relationship. Melody Balthaser’s historical romance, Seeking Sophie, takes place in New England during 1858. Orphaned and forced to become an indentured servant, Sophie stabs her master to protect herself from being raped. She escapes through the Underground Railroad. 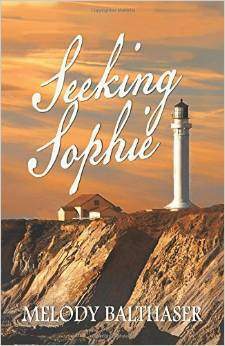 Sophie is forced to marry Jackson, the lighthouse keeper. Surrounded on three sides by water, she is leery of the solemn Jackson who prefers to be left alone. She seeks God’s guidance and finds escape for her and Jackson’s fears through God’s healing love. Historically accurate, adventurous, and love inspired, Seeking Sophie is a must read. Remember, your votes counts. So please see Facebook.com/CatherineUlrichBrakefield! Tap the Christian Publisher Award below this article. God Bless. Have you ever though about why you prefer the left or right side of the bed to sleep on? Amy Barnes and Jerry Miner, a married stand up comedy team have. Comedians oftentimes revert to bad language and sly innuendoes to grab the chuckles and laughs from their audience. Not the case last evening. My husband and I, along with some of our friends, had a wonderful time listening to Amy Barnes and Jerry Miner, a married stand up comedy team. They talked about how couples really communicate. And they didn’t use any foul language doing this! I had a ring side seat, just three rows away from the stage. The two hours flew by and I didn’t have to scrunch down in my seat, fearing Amy or Jerry might call on me to provide fresh fonder to their hilarious jokes. I did not need to worry. Amy and Jerry included their audience without embarrassing them. I especially like the one where Amy stated that marriage is a competition and you had to stay in a marriage in order to win in the end. First one to die looses. It was all good, clean fun that kept us couples in stitches for two hours. 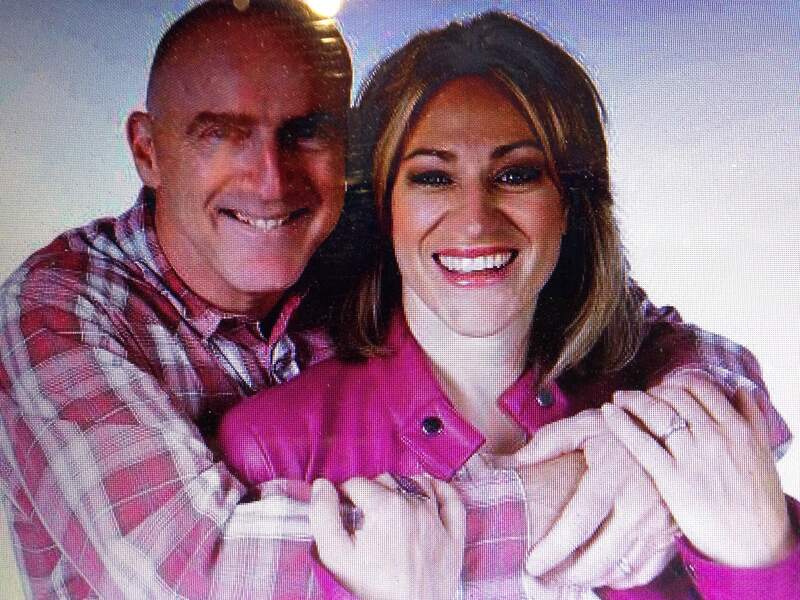 Would you believe, Amy and Jerry have been married for over ten years themselves? They began with a theater show, “The funnymooners,” in Oklahoma, then opened in Arizona with “Barnes & Miner: Let the Little Things Go.” Their shows were sold out and their stay extended to five weeks. They now travel across the country performing their humorous brand of tag team comedy. Amy and Jerry’s stand up comedy team is great for any church function, wedding or reunions. I highly recommend seeing this couple if you ever get a chance because every married couple need to question why they pick the side of the bed they do. Check out www.barnesandminer.com for more information and God Bless! (By Jessica Chasmar, The Washington Times, Friday, March 20, 2015) Ann Coulter took to Fox News Thursday night. . Appearing on “Hannity,” Ms. Coulter hit Republicans for not focusing on what she believes are the more important issues, like illegal immigration and voter fraud. “I think it’s hilarious and fantastic that Fox News is covering, you know, each hour that Obama had not — up until recently today, I guess — congratulated Bibi Netanyahu on his victory. It’s like, you know, ‘Has John Hinckley called to congratulate Ronald Reagan yet?’ ” she asked, referencing the man who tried to assassinate President Ronald Reagan in 1981, Mediaite first reported. Netanyahu did not cower in the face of left-wing ethnic agitation, and God blessed Israel. Is there something here Americans need learn? Proverbs 12:17 He who speaks truth declares righteousness. But a false witness, deceit. 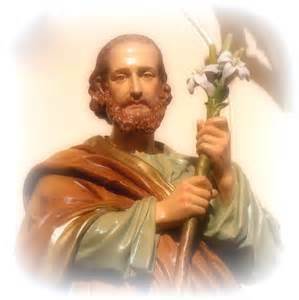 St. Patrick’s Day; a day to remember how Patrick converted Ireland to Christianity. During the Dark Ages, when European literature lay among the glowing embers of a civilization in ashes, Ireland persevered. Ireland, half the size of Kansas, became a haven for Christian authors, priests and monks throughout the continent all because of a sixteen-year-old boy name Patrick. Historians believe Patrick was born around 398 A.D. in Wales. Patrick’s village was burned by pirates and he and many villagers were captured. Patrick later wrote that because of their religious abandonment, God had forsaken him and his countrymen and allowed them to be sold into slavery. Half-starved and half-naked, Patrick tended his Irish chieftain’s sheep. Alone for months at a time, climbing the steep highlands, stumbling down into the soft marshlands, he would seek a lost lamb, knowing that if he lost one, it would mean his life. For his pagan master would sacrifice him to the war god. Upon the cliffs wet from the foaming Atlantic, slippery like ice beneath his feet, with a lamb tucked beneath his arm and a prayer upon his lips, Patrick realized that someone was carrying him across the deep crevices and sharp rocks to safety. Six years later, Patrick had a dream, and in response to that dream he escaped on a boat to France and then to Britain. He became a bishop. He returned to Ireland and spoke out boldly against Ireland’s heresies, against their paganism rituals of sacrificing infants and using the skulls of their enemies as ceremonial drinking bowls. The Celtic Druids tried to kill him, but Patrick persistently preached for thirty years enduring persecutions, and using the three-leafed shamrock to explain the Trinity. Over half of our Biblical commentaries between the years of 650 and 850 A.D. were by Irishmen. These Irish monks preached the story of the shamrock and the Good News of Christ Jesus. Their Celtic Christianity would be the inspiration civilization would flock to during the dismal days of the Dark Ages. St. Patrick, The patron saint of Ireland, wasn’t Irish and before St. Patrick’s Day became a recognized holiday, it was first recognized as a Catholic holy day. Patrick spoke out boldly against the atrocities of his time and because of his faith, Ireland became the channel that inspired Christianity through the Dark Ages. Was Patrick right? Is it possible that God would allow our enemies to overcome America because of our religious abandonment? Perhaps the best way to remember St. Patrick’s Day is upon our knees. What is your viewpoint? America is great because we serve a great God. 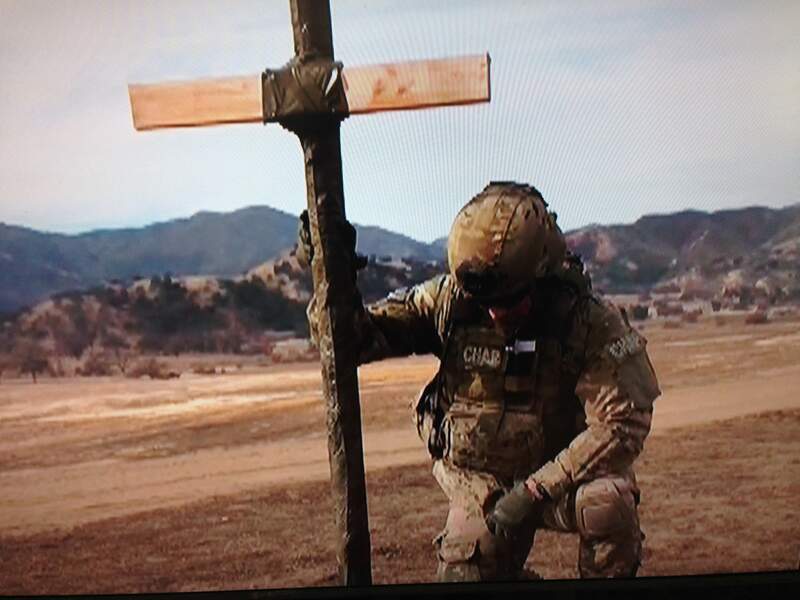 In spite of adversity, many service people continue to kneel beneath Jesus’ blood-soaked cross. My husband was given a Bible signed by President Eisenhower before stepping onto an aircraft carrier during the Viet Nam War. 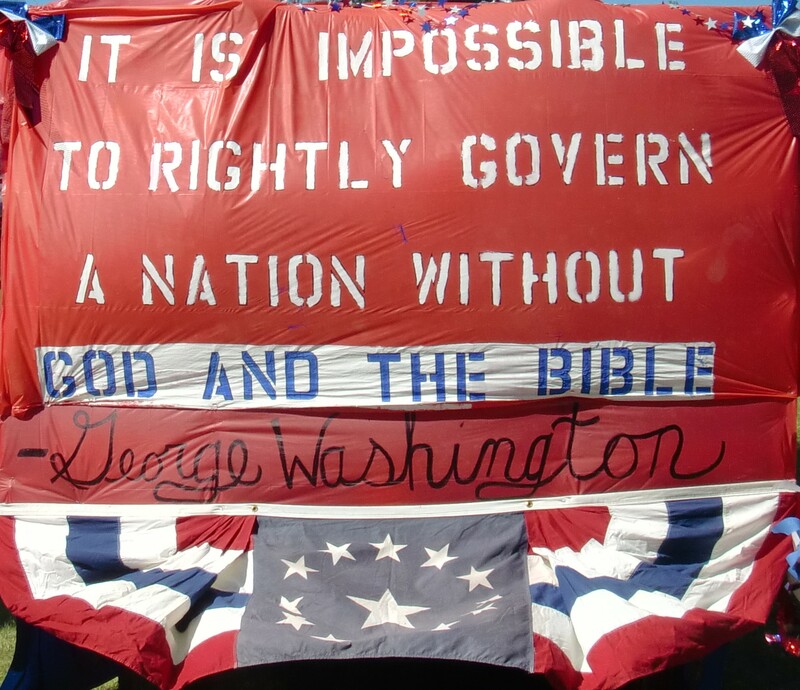 What has happened to our nation “under God”? The power of the Bible can change lives and break the chains of hate. Our presidents and leaders in the past knew this truth. Could this be the reason Post Traumatic Stress Disorder is so wide spread in our armed forces? Our forefathers knew that Jesus Christ was the key that opens wide the door to Liberty. The reason America is great is because we serve a Great God and why our servicemen, through the clutches of adversity, humbly kneel beneath Jesus’ blood-soaked cross.